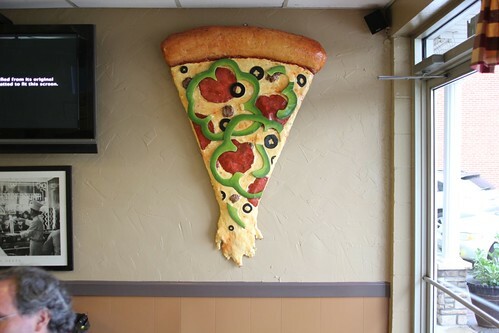 This pizza has been formatted to fit your wall. Note: I’ll be on Outside the Loop radio Thursday at 10 am, talking food. WLUW, 88.7. Check it out. So the opening of Three Dots and a Dash, the tiki joint talked about in the new Airwaves Full of Bacon, prompted a little controversy as half the food media in town went to the “friends and family” night before its official opening (media didn’t used to be friends and family, usually). (See Josh Steinfeld’s post here.) Would I have sloshed a few tweets about how friggin’ great my Zombie is if I’d gone? We’ll never know, because I had another pressing engagement that evening and I wasn’t going to break it even for the cocktails I’d spent several days of editing and mixing hearing about. Dan Zemans and I were set to roam the northwest side that night in search, again, of great unknown Chicago pizzas. Anonymously, and paid for with our own money. That’s right, we have a solid ethical principle as food writers, and the name of that principle is pizza. 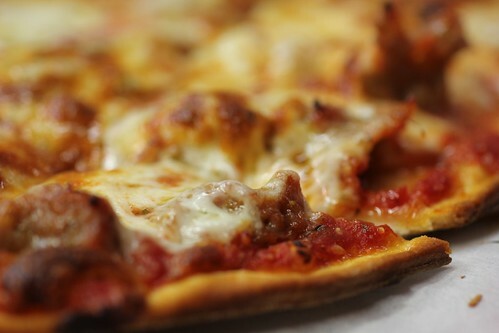 Our modus operandi is to order thin crust sausage, thin crust because it’s more common and takes less time, sausage because it best shows off the skills or tastes of the restaurant, if they make it themselves or even if it merely shows their own taste preferences and the level of quality they’re willing to pay for. (This time we also mixed it up half and half with some ringer combos, as you’ll see.) Our preference is, the longer a place has been in existence the better, but in any case, it should seem to be inspired by pizza tradition (and not be a Domino’s wannabe). Our main method for identifying them is simply searching Yelp for ones that give off clues that they might be promising. Every pizza place has somebody calling it the best pizza in the world, that doesn’t tell us anything; we’re more interested in comments that a place makes its own sausage or does something else that gives a clue that there’s blue-collar craftsmanship at work here. Again, by way of demonstrating how obscure these were, only one has anything substantive written about it a few years ago at LTHForum, a second was mentioned once in passing, and the the best one never at all. You’ve driven within 500 yards of Spuntino a million times— it’s on Higgins, on the back side of hotels you pass on I-90 on the way to the airport. But you can’t see it from I-90, so it remains in obscurity. It was a pleasant, friendly place— all these suburban places would prove to be— which has been there for about 7 years, with not only pizza but a list of decent-looking subs. (The “Chicago Hotdog Factory” on the sign is a mystery; my guess is that it doesn’t refer to Spuntino at all but to Vienna Beef, and Vienna helped pay for the sign.) 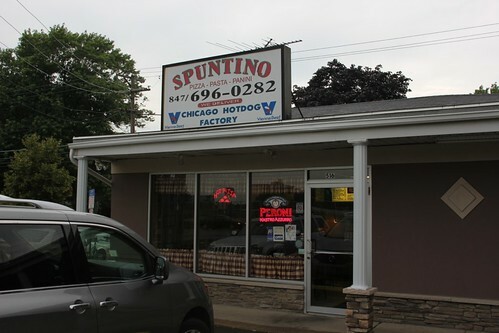 I can easily imagine being the guy working near here who convinces his coworkers to get Spuntino for lunch instead of some chain. Anyway, so it was a perfectly decent sausage thin, the other half of which was Italian beef and giardinera, which we picked as kind of an “only in Chicago” combination. They didn’t actually make it normally, but since they have an Italian beef on the menu, easy enough to make an Italian beef pizza special for us. The crust is a style that I don’t think has really been described by anyone but me: it’s basically deep-fried. That is, there’s enough oil in the pizza pan that the crust kind of fries in the bottom of it, making a distinctly crispy, almost fritter-y crust. (I talked more about this in regards to this Unknown Pizza of Northwest Indiana.) I mentioned to Zemans that I had noticed a similar effect on the crust at what appears to be his favorite place in Chicago, Pat’s Pizza, and he denied it and immediately went off on some pizza fanatic thing about how YOU HAVE TO EAT PAT’S PIZZA THERE and when you do the crust reveals the full majesty of its filo-like layering. He says there’s some video online that shows it, not sure if this is the one but it hints at what he’s talking about here, around the 1:10 mark. But back to Spuntino. So, crispy crust, pretty good cheese, sauce and sausage, good caramelization (I snuck a peek at the kitchen— they use a classic Faulds oven, just like Pizza Castle last time)— in the end Spuntino would wind up ranking third but really, it’s a perfectly good neighborhood pizza run by nice people. If you need a bite on the way to O’Hare sometime, check it out. Des Plaines turned out to have a lot of neighborhood pizza places that sounded pretty good, but even given our predisposition against paying any attention to the ratings on Yelp, it was hard to ignore the fact that Caruso’s had nearly all five-star ratings and virtually no bad ones (which in all these cases were usually service complaints), which put it well above the pack. We popped in there and it was, indeed, pretty much the perfect Chicago hole in the wall in a strip mall, located in the boondocks of Des Plaines for 20 years and run, it looks like, by two brothers. 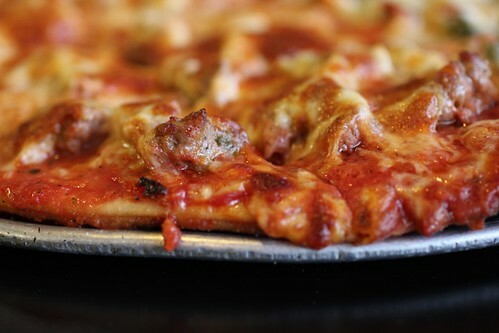 That it’s dedicated to the old school ways is clear from the menu board, which has three sections— the entire first one is devoted to sausage pizza; all other topping choices are crammed onto the middle board. While we were there the other customers were a Muslim family feeding hamburger pizza to their kids, and an Italian guy in a pink track suit and gold chains who could have walked right out of Casino. The pizza maybe had a little too much cheese for some connoisseurs of the Chicago old school thin, but on the whole this managed a narrow win for the evening— better sausage than Spuntino, a nice crackly crust, flavorful sauce— really, it’s everything a thin crust sausage pizza should be. You’ll notice that I haven’t really talked about the Italian beef half of the first two pizzas yet. I think we ordered it in part because we thought it might be a way to sample the Italian beef, but… no, you don’t really taste the Italian beef in any way that could lead you to say “I should come back and try the Italian beef.” It’s kind of lost in cheese and tomato sauce and grease, which is WHY THEY DON’T PUT CHEESE ON ITALIAN BEEFS. This Gigio’s is no relation to the divey Uptown Gigio’s, but as it happens, it does have a Chicago history. But let me back up. We get there and see an older couple making their way, slowly and a bit stooped, to a car at the side of the restaurant. We go inside and the guy is very pleasant, just perceptibly eager to get us to make an order. I realize it’s 9:55 and they close at 10, so we hurry and order. He never says a word explicitly that we should hurry up, lets us order what we want, so I thank him for that. We’re done with the Italian beef experiment, but Zemans notices bacon on the menu and he wants that for the other half. I suggest black olives, thinking it will be sort of like ham and olive, a reasonable combination. 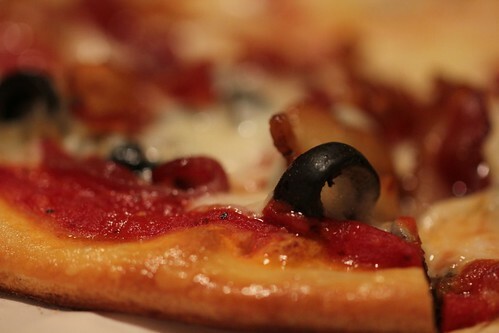 I’ll just say, there’s a reason you’ve never seen bacon and olive pizza as anybody’s special. It’s a strange, strange combination of flavors, smoky-sweet and salt-cured, and not in a complementary way. They have pizzas sitting out for slices, too, and they look more like New York pizza, frankly, but somehow when we get ours it’s not like that; the crust is a little tall but it’s not really like the big roll at the edge of a New York pizza at all. 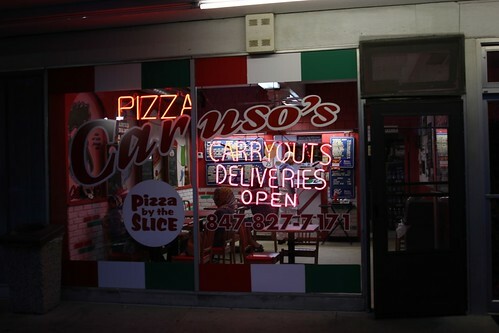 The pizza rates very highly, overall, the best, most fennel-y sausage of the night, but I would ask for the cheese cooked to well done next time, that’s a little of a letdown next to Caruso’s. Interestingly, the size we ordered is normally cut in NY-style triangle slices, but the sizes further up are all cut in squares, Chicago style. Anyway, as it’s baking we chat with the guy. Sure enough, that was Mama Nitti, his mom, and his dad going out to the car after working a whole day in the restaurant. 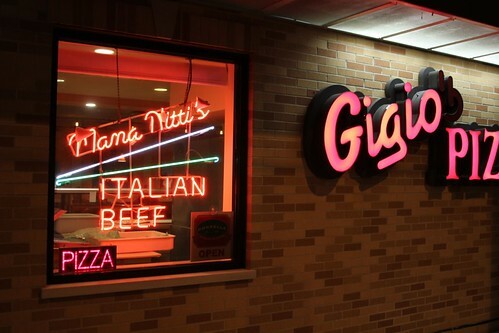 They started 40-some years ago at Devon and California, were located in Niles (where they live) for many years, and moved to Des Plaines a few years ago, bringing the Mama Nitti neon sign the whole way. There’s nothing that exceptional about the story he tells about the family running the place— the sausage is made for them to their recipe is the most interesting part— except that, of course, everything about a family running a business the right old way like this is exceptional and deserves to be known and celebrated. I will definitely find a reason to go back and try Mama Nitti’s Italian beef one of these days. So exploring the northwest suburbs proved to be different from exploring the southwest side. 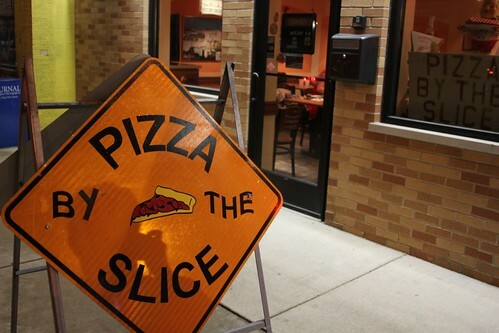 In the less prosperous city, the danger is that places which were once good have lowered quality to be able to sell cheaply, and where a family might once have run it with pride, employees could care less and it loses what made it distinctive once and becomes mere generic pizza. That was why Pizza Castle seemed such a happy find by comparison. Here, the places we tried were all pretty good and pretty well run, they all had their strong points, and they’re all plainly rooted in a serious pizza tradition and are trying to live up to a model of Italian-American, classic Chicago pizza that hasn’t been compromised by the popularity in other suburbs of blandly American chain pizza. All of these were pizzas you’d be pleased to have nearby. Good Lord – I’m having flashbacks of the bacon/olive combination. I still can’t figure out why it was so wrong. Maybe it was the competing versions of intense sodium? This was a very productive trip and I agree entirely with the recap. I’ve even changed my tune about probably never making it back to Gigio’s (I’m pretty sure up until this trip I’d only gone to Des Plaines to visit Paradise Pup) as I’ve grown increasingly curious about the Italian Beef. Lastly, I feel compelled to point out an error on my part, lest a reader doubt my knowledge of the Chicagoland area. I did say multiple generations of Italians but I mistakenly thought I was talking about Norridge and the possible NW City/Burbs list you compiled, not the NW Burbs list. As far as I know, there’s no significant Italian history in Park Ridge or Des Plaines. Though they sure have lots of pizza places for not being very Italian.